Sicilian Odyssey: You Paid What for It? You Paid What for It? I saw this wine on sale at Carrefour (large supermarket) for .99 Euro ($1.41) recently and thought, "Hey, for that price, I should try it, and if it's bad, I'm not out much money." They had cases of it and lots of Sicilians were buying it. So I bought a case of six for less than six Euros. I opened it that evening, not expecting much. I LOVE THIS WINE! It's a great Nero d'Avola, the most popular red wine in Sicily. It's full-bodied but not too heavy, certainly not too dry or at all harsh! Needless to say, I have bought another case since then and even at the regular price of 1,15 Euro ($1.64) per bottle, it's an incredible bargain for the wine. The d'Avola grape was "developed" at the town of Avola, near Noto and south of Siracusa. Now it's grown all over Sicily. 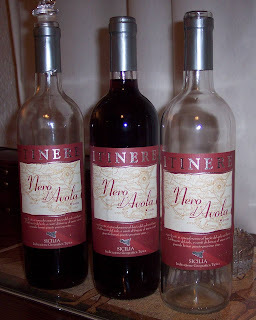 The label decribes it as "a product of the nero d'avola grape of Sicily. Rich, decisive and generous,a red with a strong personality and a aromatic and intense taste. Serve at 16-18 degrees C. with red meat, sharp cheese and 'sturdy' pasta." The winery is Itinere, which is located in San Mauro Castelverde in the Palermo area. This is why I cringe at paying $8 a glass for wine in the States when 90% of it isn't even as good as this wine for about what, 50 cents a glass? I had the same experience when I was staying for a couple of weeks in an apartment in Paris near the rue Montorgueil. In a wine shop on that street, I found some wine for .99 Euro, thought I've got to at least give it a try for that price, and absolutely loved it. Unfortunately I live in Northern California, and $8 for a glass of not anywhere near as good is common.